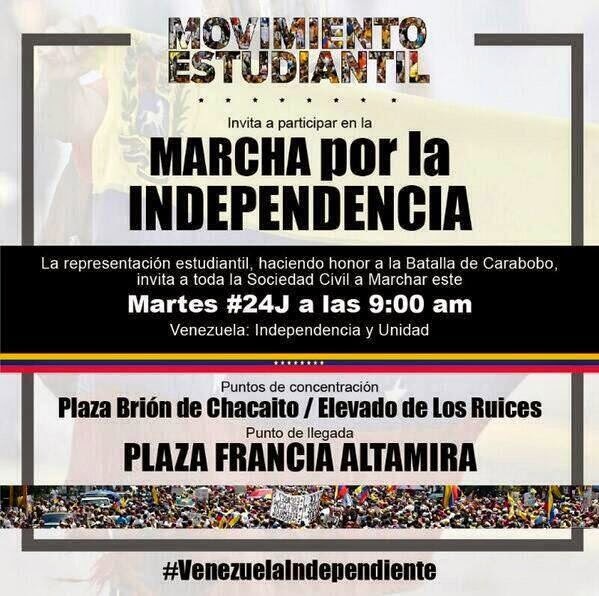 Across the social networks the announcements are made that a national march for independence is being called by the student movement that will take place across the country on Tuesday, June 24, 2014. All eyes on Venezuela. Beginning tomorrow June 24, 2014 at 9:00am Caracas time. 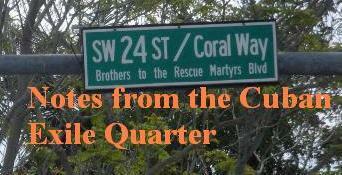 Remember that the death toll during these protests by agents of the Maduro regime has reached 43. 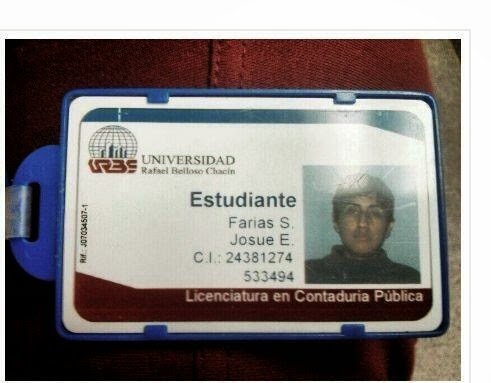 Josue Farias died in Maracaibo on June 21, 2014. The 18 year old student was injured by a bullet during protests at URBE on May 29, 2014. 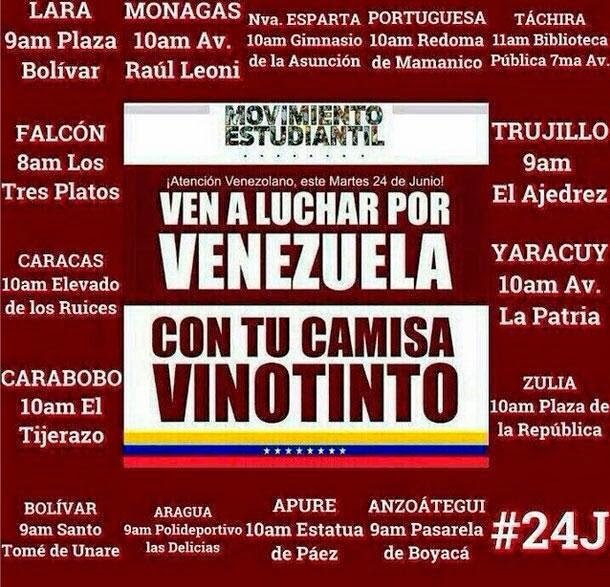 "This Tuesday #24J join the #students in the #MarchForIndependence, #Venezuela it is our common cause." 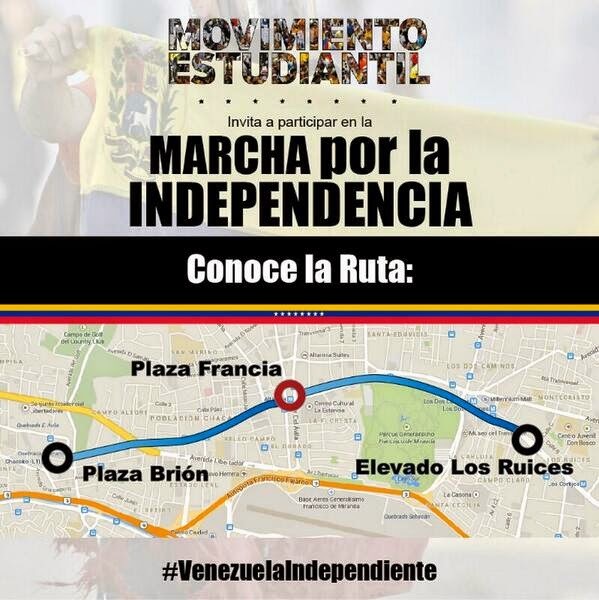 "This is the route #VENEZUELA will travel together on #24J for NATIONAL INDEPENDENCE #IWillGoOut24J & you?" "TOMORROW #24J day of nonviolent protest at the national level, these are the gathering points:" and tweeted all of them along with times that they would be meeting up. The students are risking not only their freedom but their very lives for a free Venezuela the least that the outside world can do is be vigilant and denounce any abuses by the Maduro regime.